Temporary recruitment is an sector where invoice finance is broadly used, even new startup companies can get access to this kind of funding, which can enable recruiters to get their own company off the ground without the need for investment or investors. 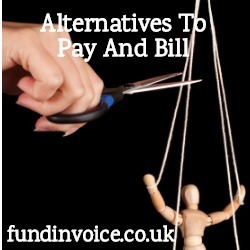 There are a wide variety of invoice finance companies that help recruitment companies, offering differing degrees of support (payroll and accounting, even invoicing can be included in some cases - through to pure finance only services). I have written previously about some of the pitfalls with some recruitment outsourcing companies, which I was reminded of when I recently read a blog post about the possible drawbacks of "Pay and Bill" services. These are where a temporary recruiter uses an outsourcing service to pay their candidates before they are paid by the customer for the placement, and they are paid the profit margin by the outsourcer, less charges (which can be significant in some cases). Typically these arrangements include a range of outsourced services such as raising the invoice for the recruiter. In some cases customers can feel like they have little control over their business, almost like they are working for the pay and bill company. The post went on to outline a number of practices such as charging additional fees, holding back of VAT, PAYE etc. to pay HMRC, such that funding is well below typical funding levels granted by traditional invoice finance companies. All of which can lead to the cost of these pay and bill arrangements being more than having your own invoice finance arrangement. If you take out your own recruitment invoice finance facility, there are lots of options around the kind of service provided to recruiters. Some providers offer just the funding (typically at levels of 85 - 95% - or even 100% in some cases), others offer additional services such as payroll management, credit control, bad debt protection even accounting services that you can add on - if you choose a more comprehensive solution for recruiters. You remain in control of your business, deciding the level services that you want to outsource. You can opt for a confidential invoice finance service. This means that your customers are unaware that you are even using an outsourcing service, as there in no notice of assignment on the invoices and you either handle the credit control yourself, or it is provided in the name of your company (using separate phone numbers answered as your company, and paperwork that shows your branding).